Come and try some of Spain’s most mouth-watering Tapas from the extensive but inexpensive Tapas menu or choose from the a la carte menu of continental dishes including meat, chicken, fish, pasta and paellas. 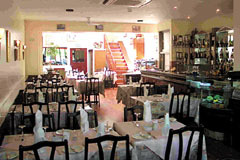 All dishes are cooked and served by Domingos and his family who have over 20 years experience in the restaurant trade and you are assured of excellent food in a warm and pleasant family environment. Select any two Tapas plus bread at lunch time for only £6.00. Domingos, Ana, Rosa and Victor are the Pereira family - a Portuguese family who have been in the restaurant/catering trade for over 25 years. Domingos started leaning his restaurant trade back in the heart of the West End in the late sixties. In the seventies he was the head chef at Jaspers, now known as Browns in Kew. After several years he moved to East Sheen continuing his trade as a head chef. In the eighties he was offered a partnership. He was to stay for 21 years serving the public at Carlo Domingos. Here all of his skills and years of knowledge and dedication was used to train his nephew, Augusto, who has been the head chef for the family for the past 9 years. The Pereira family, after a small break, have decided to return and offer the people of Northfields and Ealing their experience in the restaurant business. They aim to offer a selection of mouthwatering Spanish tapas plus a full a la carte menu in a warm and pleasant family environment. Open Mon-Sat 12-3pm and 6-midnight (closed Sun). All major credit cards accepted. 10% service charge only on bills over £50. A range of delicious tapas together with Spanish and Continental dishes. Currently there is no review for this restaurant. Click below to write the first review.